The Myasis Dragon began its bomb run over Merseburg, Germany, flying into heavy flack as it approached the designated target. The bomb bay doors were opened and Myasis Dragon was ready to drop its ordnance upon command. Visibility was excellent as the bombers lined up to release their payloads. A multitude of fires and explosions were visible below as each plane made its run. Merseburg was the target of the day and 39 crews were dispatched to hit the Leuna Synthetic Oil Plant, an eight hour round trip. It was not a favorite target of combat crews because of the heavy artillery positioned around the plant. “Friendly fighter support was good,” noted a report at the post flight briefing. “Anti-aircraft fire was very intense and accurate—probably the most ever encountered by 303rd BG(H) crewmen,” it continued. The Myasis Dragon, a B-17G, was part of the 303rd Bombardment Group, known as the Hells Angels. During WWII, they were part of the 8th Air Force stationed in Molesworth, England from 1942 until 1945. Their motto was Might in Flight, and the title was surely earned during their record 364 combat missions. 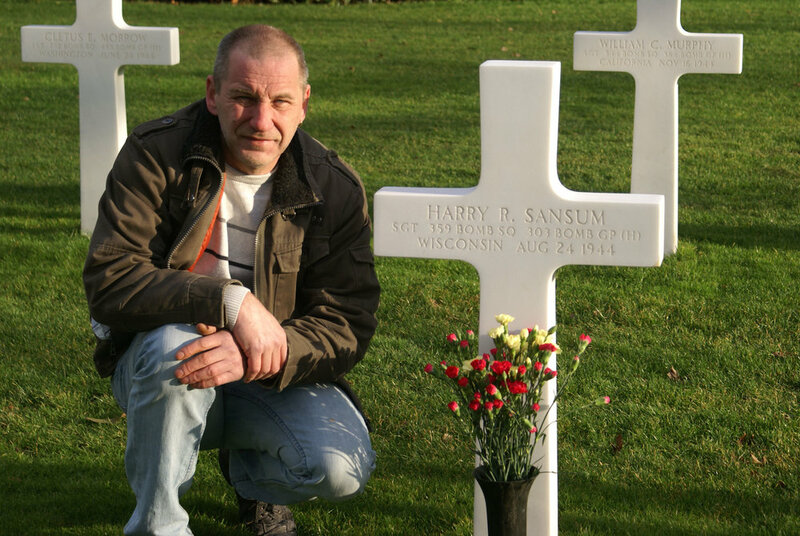 Twenty-six year old Sergeant Harry R. Sansum, a native of Baraboo, Wisconsin, was a waist gunner on the Myasis Dragon. As the plane leveled off over the target, the crew could see anti-aircraft tracer fire coming at them from the ground below. As they closed in on the plant, the first of three shells hit the Myasis Dragon’snumber three engine blowing it apart. The second hit just below the radio compartment as T/Sgt. Girman, the radio operator and gunner, loosened his flak jacket and clipped on one of his parachute rings. The last burst entered the open bomb bay door and exploded between two bomb racks. The plane was immediately engulfed in flames, disintegrating as it peeled off and went into a vertical dive. Sgt. Girman later described seeing the aircraft melting before his eyes. The explosion showered several nearby aircraft with burning metal. 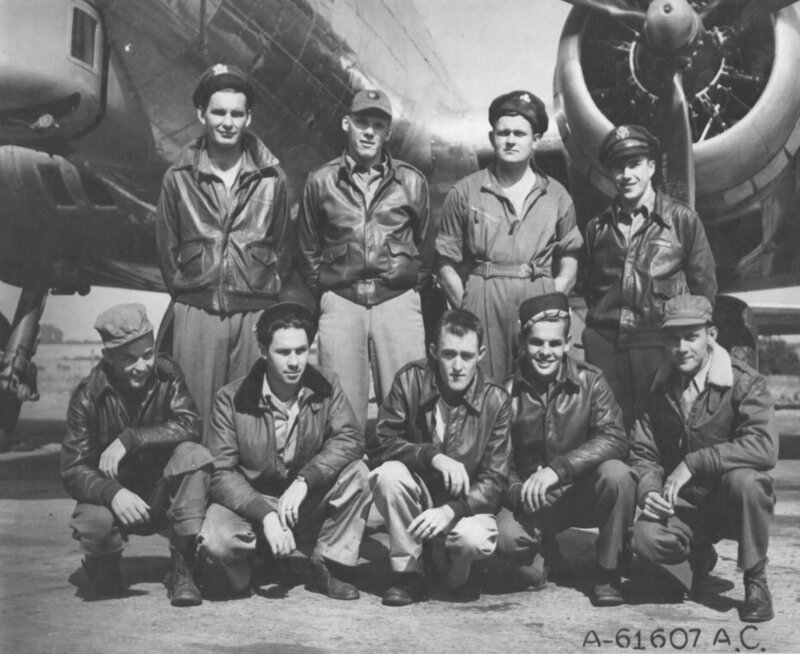 (crew assigned 359BS: 16 July 1944) (Back L-R) 2Lt Jack R. Hillary (P-KIA); 2Lt William Robertson III (CP-KIA); 2Lt John E. Rice (N-KIA); 2Lt Rocco De Filippis (B-KIA) (Front L-R) Sgt Neldon Reid Bishop(BT-POW)(1); S/Sgt George E. Paul (E-KIA); Sgt Harry R. Sansum (WG-KIA)(2); S/Sgt Eugene E. Girman (R-POW)(1); Sgt James R. Watson (TG-POW) Photo courtesy of www.303rdBG.com. They both landed near Torgau, about 30 miles east of Leipzig and were immediately captured and sent to a German prisoner of war camp for nine months. After his repatriation at war’s end, Sgt. Bishop reported having seen the body of Harry R. Sansum lying on the ground near where he (Bishop) had landed. Sansum was not wearing a parachute. The other six airmen on the plane also perished. The date was August 24, 1944. For his service to his country, Sgt. 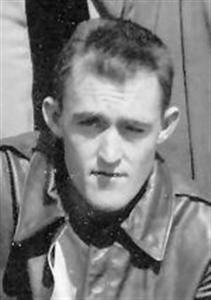 Harry R. Sansum posthumously received the Air Medal and Purple Heart. Eugene Girman died in 2004, and Reid Bishop, a year later. Fast forward seventy years to March, 2014. The Sauk County Historical Society received an e-mail from Martin Maijntz a resident of the Netherlands. He wrote that he is a member of the Fields of Honor database, a Dutch non-profit organization. “This foundation has set as its goal to honor American World War II servicemen who have fought and died for the freedom of others and have been buried in overseas American Cemeteries,” notes its mission statement. Their objective is to research each serviceman buried there and give a face and history to the names of those who perished in combat defending their freedom. As part of his dedication to that mission, Maijntz began researching the history of Sgt. Sansum. His search eventually led him to contact the Sauk County Historical Society in Baraboo for more information. He was specifically looking for any surviving relatives. Linda Levenhagen, Office and Research Manager, and Bob Doepke, research volunteer, began searching the Society’s archives for any information on Sgt. Sansum. They were able to locate 1944 newspaper items which chronicled the death of Sgt. Sansum. After finding the names of his siblings, a search of city directories and marriage records at the Register of Deeds office revealed a living relative, Patti Kay Beach, one of the great-nieces. Mrs. Beach is now in direct contact with Mr. Maijntz.